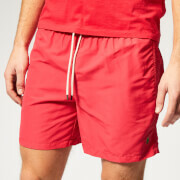 Men's shorter length swim shorts from Orlebar Brown. 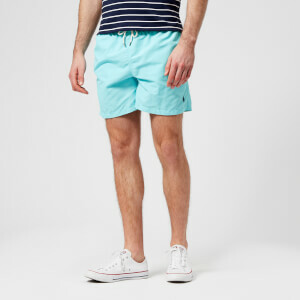 Based on the traditional 17-piece pattern of men's suit trousers, the 'Setter' swimming shorts are crafted from quick-drying, chlorine-tested polyamide and have been designed with a shaped waistband, signature, adjustable side-fasteners and rear darts for superior shape and comfort. Equipped with a zip fly, popper fastening and three pockets: two side seam pockets and a rear zipped pocket. Fitted with net lining for extra support and security. Vented side hems provide comfortable movement. Subtle branded tab to the left pocket. Sourced and manufactured in Europe.